Given that this is a long post, here’s a quick index. Crap, I forget. How does this cousin thing work again? In organic chemistry, we may likewise find ourselves puzzling over questions like, “how are these two (or more) molecules related”? And much like family terminology, remembering the distinctions between constitutional isomers, stereoisomers, enantiomers, and the like can be a struggle at first. Thankfully the answer to each of these questions is very clear cut, and I hope that you will find that with practice (and a few vivid examples) are easier to remember than the whole third-cousin versus second-cousin-once-removed thing. A molecule can be several types of isomer at the same time, depending on which molecule you are comparing it to. To use our family analogy: the terms “brother”, “sister”, “mother”, “daughter” are words that describe relationships between (at least) two people. You can be a daughter (to your mom), a sister (to your brother), a cousin (to your aunt & uncles’ children), and “not related” (to me) all at the same time. To ask whether you are a daughter OR a sister makes no sense without the context of including the person “to WHOM” you share that relationship. So it is with molecules. 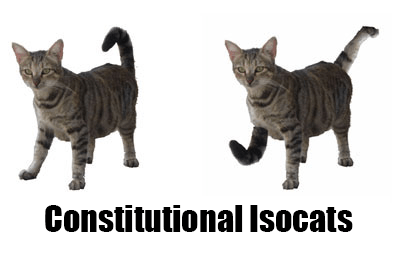 A molecule can be a constitutional isomer, diastereomer, enantiomer, and more (or none! ), all at the same time to different molecules, depending on which other molecule(s) you are comparing it to. There are three important distinctions to learn, and we will go through them each in turn. (on exams especially, there’s always the possibility that a “given pair of molecules” is actually the same molecule, drawn differently. We’ll cover that possibility too). Through circumstances I will leave to the reader to figure out, it is possible for someone to simultaneously be both a father and a brother to the same individual. Thankfully, we have no such problems in organic chemistry. Two molecules might be stereoisomers of each other, but they can’t be stereoisomers and constitutional isomers of each other. The distinctions are clear. Isomers are two (or more) molecules that share the same molecular formula. For some molecular formulae, no isomers exist. For example, there is only one possible isomer for CH4 (methane), C2H6 (ethane) and propane (C3H8), and only two are possible for C4H10 (2-methylpropane and n-butane). As the number of carbon atoms increases, however, so does the number of possible isomers. For dodecane (C12H26), 355 isomers are possible. And it only goes up from there! Despite sharing the same molecular formulae, isomers may have very different physical properties, such as boiling point, melting point, and chemical reactivity. Take cyclohexane (b.p. 63 °C) and 1-hexene (80 °C) which both have the molecular formula C6H12. No matter how different their physical properties, or reactivities, their common molecular formula makes them isomers of each other. Likewise, propionic acid and 1-hydroxy-2-propanone share the same molecular formula, C3H6O2, making them isomers of each other (but not isomers of cyclohexane or 1-hexene, of course!). This leads us to the next question. Let’s say that two given molecules are isomers. What kind of isomer are they? 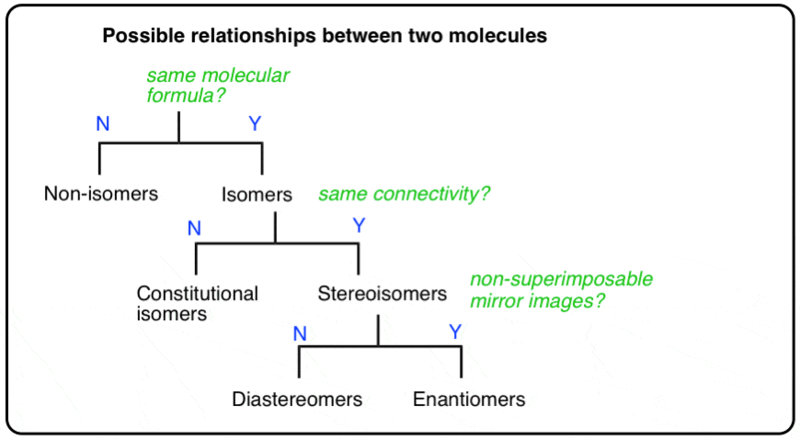 Isomers divide neatly in to two categories: constitutional isomers (different connectivity) and stereoisomers (same connectivity, different arrangement in space). So what does that actually mean? 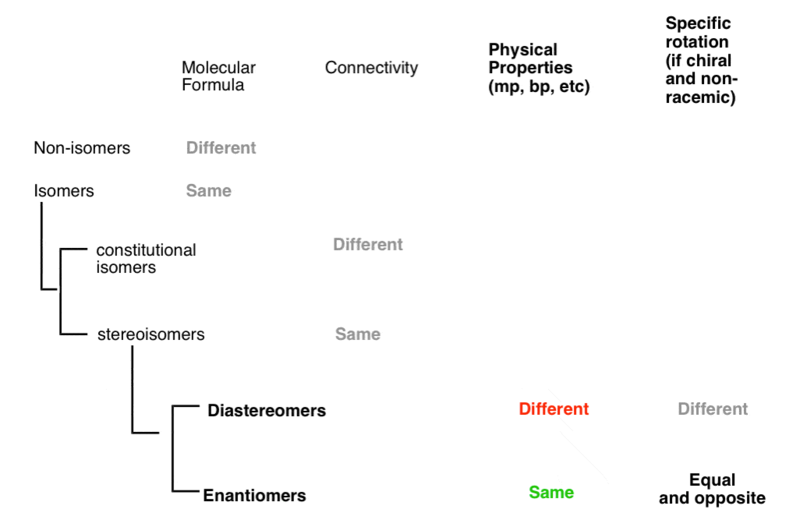 Constitutional isomers have the same molecular formula, but different connectivities. That’s fun, but is there a more rigorous way to think about connectivity? Yes – from nomenclature. 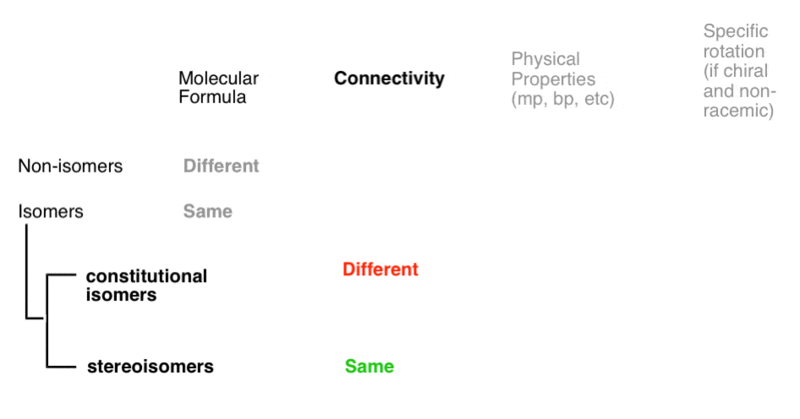 If two molecules with the same molecular formula have different connectivity, it will be obvious either in the locant (e.g. 1-hexene vs. 2-hexene), or in the substitutent(s), prefix, or suffix. e.g. 2-methylpropane vs. butane, or 1-pentanol vs. ethyl propyl ether. Constitutional isomers have the same empirical formulae but their core IUPAC names are different. If the only point of difference in the names of two molecules is their (R)/(S) or (E)/(Z) designations (or cis/trans) then you’re dealing with stereoisomers (next section). By way of an example, these 5 molecules are all constitutional isomers of each other. They have the same empirical formula (C6H12) but different connectivity. Note how the IUPAC names are all completely different as well. There is only one way to connect C6H12 together to form cyclohexane, and only one way to connect the same atoms together to get 1-hexene. But there are two ways to connect C6H12to give molecules with the names 2-hexene, and 3-methyl-1-pentene! And four ways to connect C6H12 to give 1-ethyl-2-methylcyclopropane! (Quick way to identify a well-trained organic chemist: ask them to draw 2-hexene, and measure how quickly it takes them to say, “which one”?). For example: there are two ways to arrange the hydrogens on the double bond of 2-hexene; when they are on the same side, we refer to it as cis (or Z); on the opposite side, trans (E). [See: Cis and Trans and E and Z] . Since free rotation about the double bond is not possible, these are completely distinct molecules. They can be separated, put in different flasks, left on the shelf for years, and never interconvert. You can buy cis-2-hexene (95%) from Aldrich, leave it in the storage room for two decades, and never fear that it has turned into the trans form. What kind of isomers are these? We can’t call them constitutional isomer, since they have the same connectivity (both are 2-hexene! ). We need another name. Since they differ in the arrangement of their groups in space about the double bond we call them stereoisomers. Stereoisomers can also arise from tetrahedral carbon atoms that are attached to four different substituents (i.e. a “chiral” or “asymmetric” carbon) as in 3-methyl-1-pentene. There are 2 (and only 2!) different ways to arrange four different groups around a tetrahedral center, which gives rise to two molecules which share the same connectivity but differ in the arrangement of their atoms in space. These molecules may look the same, but they are actually non-superimposable mirror images (more on that a few paragraphs below). A molecule that has 2 stereogenic elements can give rise to as many as (2 × 2) = 4 different stereoisomers. That is the case with 1-ethyl-2-methyl cyclopropane: (R,R), (S,S), (R,S), and (S,R). A molecule with 3 stereogenic elements can give rise to as many as (2 × 2 × 2) = 8 different stereoisomers. 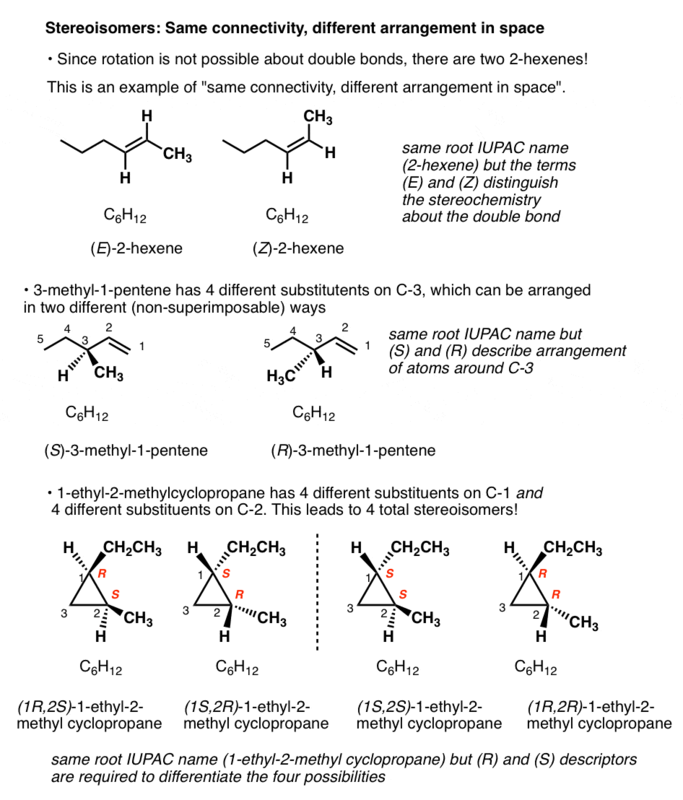 One quick way to tell if two molecules are stereoisomers is if they have the same core IUPAC name but differ in their cis/trans, E/Z, or (R)/(S) designations. We’re not quite done. There’s a final important distinction to be made between two different types of stereoisomers. This is not unlike the distinction between diastereomers (stereoisomers that ARE NOT non-superimposable mirror images) and enantiomers (stereoisomers that ARE non-superimposable mirror images). I will admit: the term “non-superimposable mirror images” seems to give people as much trouble as the “second cousin versus once-removed” thing. So let’s address this right now. 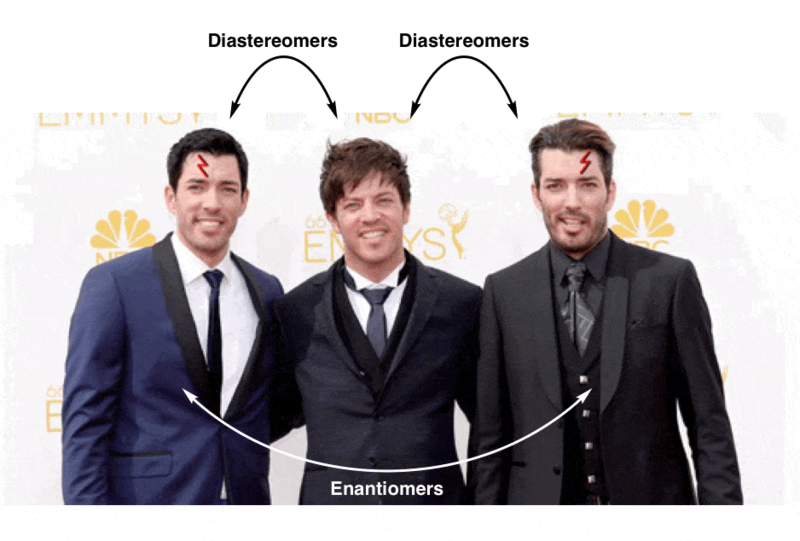 In our family analogy (above) we made “brothers who are identical twins” analogous to enantiomers, and “brothers who are not identical twins” analogous to diastereomers. We need to tweak this analogy a bit. In organic chemistry, two molecules that can be superimposed on each other, through rotation of bonds (i.e. conformational changes) or through rotation of the molecule itself, are considered to be the same molecule. 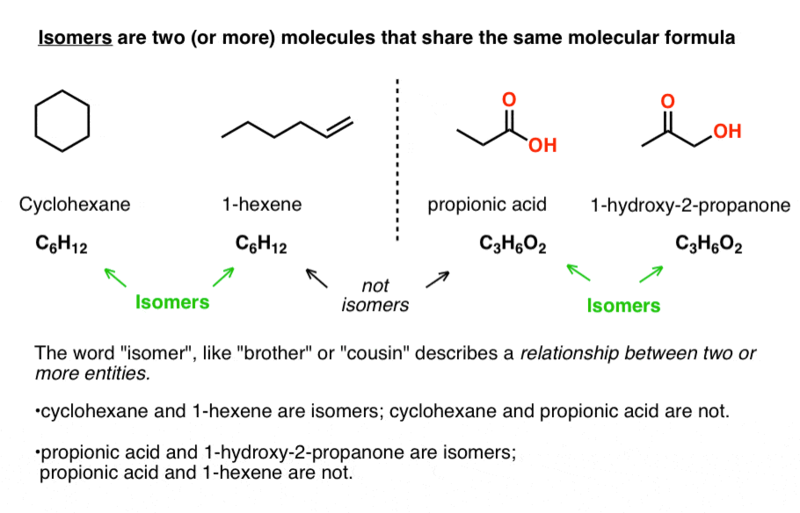 In other words, in organic chemistry, molecules that are “identical twins” are not isomers; they are considered to be identical copies of the same molecule. Now, let’s make a little modification to our identical twins so that they go from being superimposable mirror images (= the same) to non-superimposable mirror images. NARRATOR: Our client, “Lord Voldemort” said he was looking for a new evil lair with “good bones”, so we took him around town to look at some properties that fit his list of “must haves” and budget. Later that evening, after a few drinks, things got awkward. LV: The property of CHIRALITY! Racemundum suorum! One has a scar over his left eye and the other has a scar over his right. No amount of twisting and turning on the floor in pain can possibly make them superimposable now. 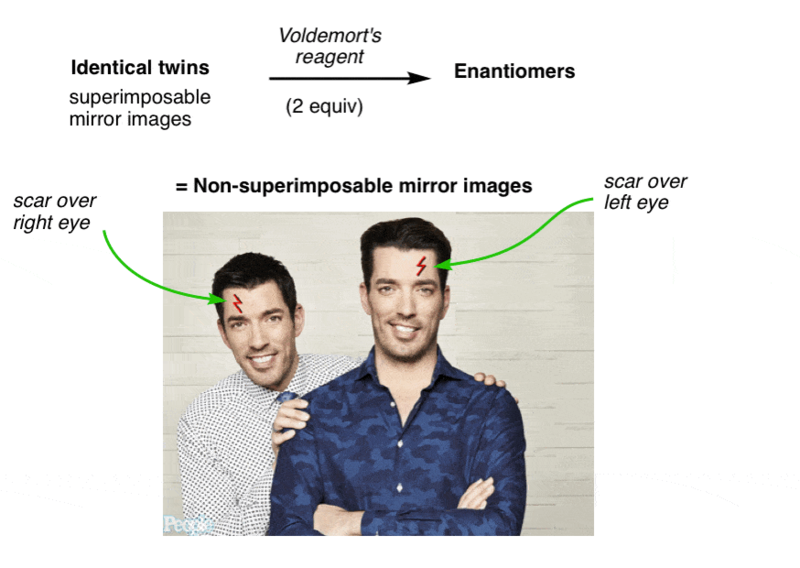 They have become “enantiomers”: non-superimposable mirror images. 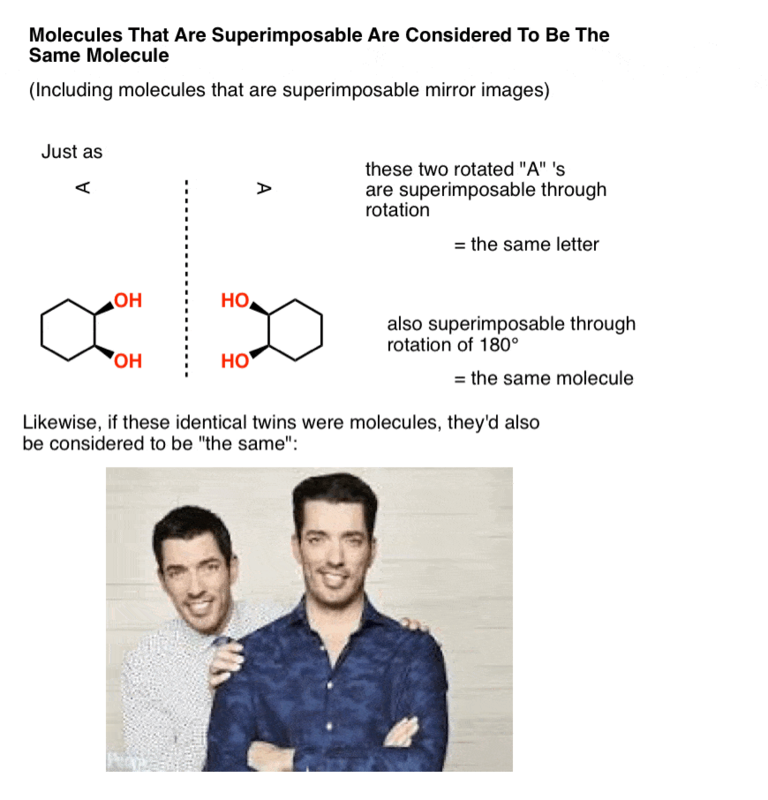 Since they are no longer superimposable, in chemistry terms they are no longer the same. Similar, yes! But not the same molecule. Before we added Voldemort’s reagent, each twin had a plane of symmetry along the middle of his body such that the left and right halves were identical. No more. 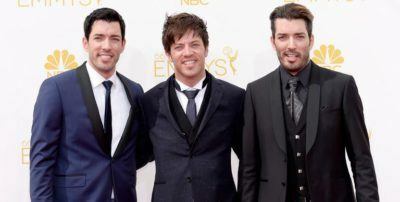 Now the left half of each twin is different from the right half. We call this property “asymmetry”, or “chirality”. The introduction of the scar “broke the symmetry” of each twin and introduced chirality. With molecules, the most common way to impart chirality is with a carbon bearing 4 different groups, as in 4-methyl-1-pentene, above. For this reason a carbon attached to 4 different groups is called a chiral center, or “asymmetric center”. There are two (and only two!) ways to arrange 4 different substituents around a tetrahedral carbon. So a molecule with a single asymmetric center will exist as a pair of stereoisomers. To be more specific, it will exist as a pair of non-superimposable mirror images: enantiomers. 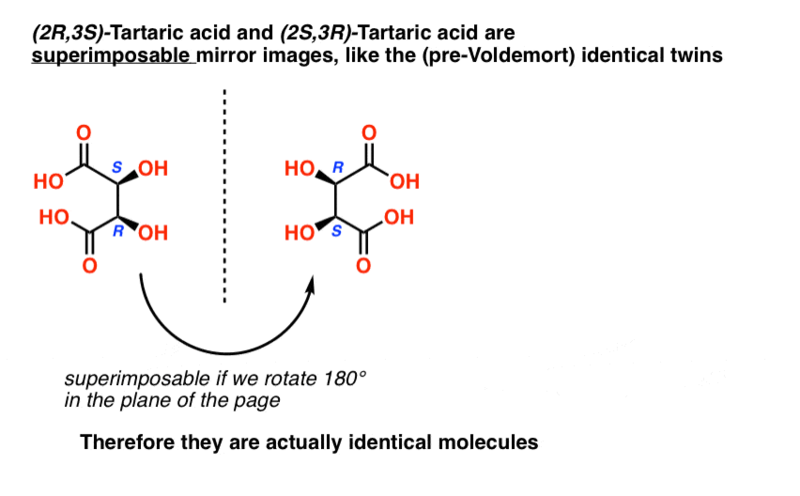 Earlier we described Louis Pasteur’s adventures with tartaric acid [See: Optical Rotation, Optical Activity, and Specific Rotation] where he discovered that a compound then known as “racemic acid” (from Latin racemus = “a bunch of grapes”) was in fact an equal mixture of two mirror-image forms of tartaric acid. Separating these two isomers was hell on wheels, since they have identical solubilities, melting points, and other physical properties. Pasteur was only able to accomplish it through observing minute differences in the appearances of their salts, and picked them apart using tweezers and a magnifying glass. The only physical property which differentiates these two isomers is that they rotate the plane of polarized light in equal and opposite directions. With hindsight, we now know the structures of these two isomers of tartaric acid, and using the Cahn-Ingold-Prelog rules, have named them (R,R) and (S,S) tartaric acid. These two isomers are mirror images of each other: Non-superimposable mirror images. Note that they have the same core IUPAC name (2,3-dihydroxysuccinic acid, a.k.a. tartaric acid) but their R/S terms are completely opposite: (R,R) and (S,S). Enantiomers will always have the same IUPAC names, and completely opposite (R/S) descriptors. Tartaric acid has two asymmetric carbon centers, and we said earlier that a molecule with two asymmetric centers can have up to 22 = 4 stereoisomers. If (2S,3S) and (2R,3R) are two stereoisomers of tartaric acid, then what about (2R, 3S) and (2S, 3R) tartaric acid? These should also be stereoisomers, right? When we draw out the structures of (2R,3S) and (2S,3R) tartaric acid, however, something quickly becomes apparent. They are superimposable mirror images, and therefore considered to be identical molecules. Therefore (2R, 3S)-tartaric acid and (2S, 3R)-tartaric acid are not enantiomers. They are actually two different ways of describing the same molecule, and tartaric acid only has three stereoisomers overall. Wait. How can it be that a molecule can have chiral centers but not have an enantiomer? 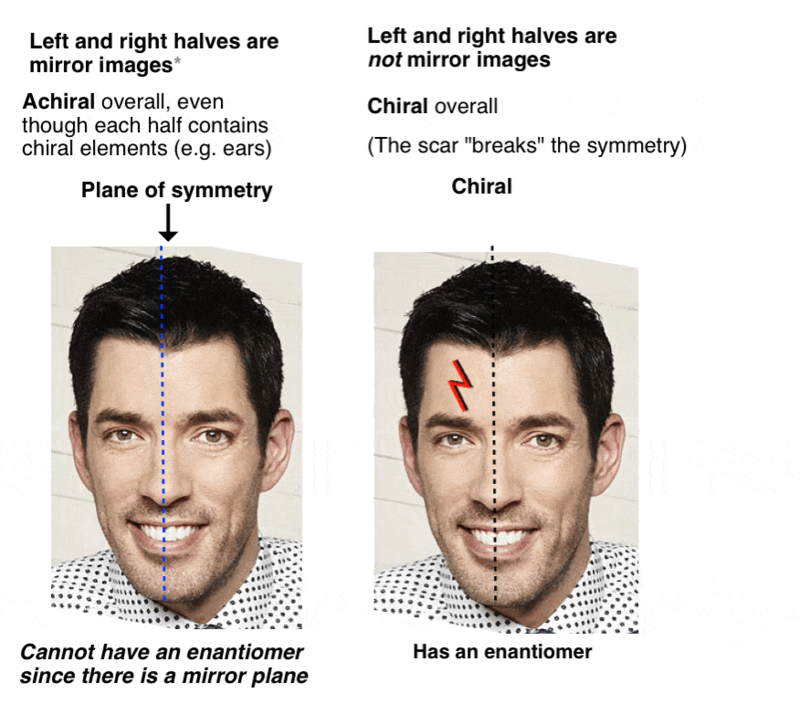 Just in the same way as our (pre-Voldemort) Property Brother had (chiral) left and right ears, but was achiral overall due to the internal mirror plane. Only chiral molecules can have enantiomers. A molecule with an internal mirror plane – a plane of symmetry – is achiral and will not have an enantiomer. Likewise, (2R, 3S)-tartaric acid has chiral centers, but possesses an internal mirror plane. The chiral center with the S configuration is the mirror image of the chiral center with the R configuration, and the other substituents are arranged symmetrically. This stereoisomer of tartaric acid was known to Pasteur, since it could readily be separated from “racemic” tartaric acid owing to its different physical properties (solubility). Since its specific rotation (0°) was in “the middle” (meso = “middle” in Greek) between levo (–) and dextro (+) tartaric acid, it was given the name meso-tartaric acid. Knowing what we do now, it makes sense that meso-tartaric acid has a specific rotation of 0°, since only chiral molecules rotate the plane of polarized light, and meso-tartaric acid is achiral. The name “meso” has been adopted more generally. A “meso compound” is a molecule that has chiral centers, but is achiral overall due the presence of an internal mirror plane. This is why the qualifier “up to 22 stereoisomers” was used. A molecule with 2 stereocenters can have “up to ” 4 stereoisomers, but may have less than 4 if a meso form is present. 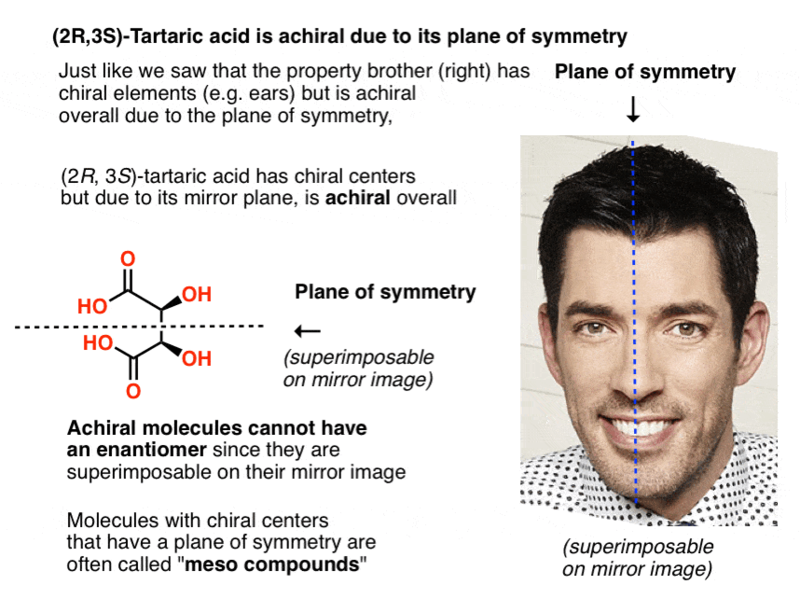 meso-tartaric acid is kind of like the third Property Brother: “the one who isn’t a twin”. So if (2R, 3R)-tartaric acid and (2S, 3S)-tartaric acid are enantiomers, how do we describe the relationship between each of these molecules and meso-tartaric acid? 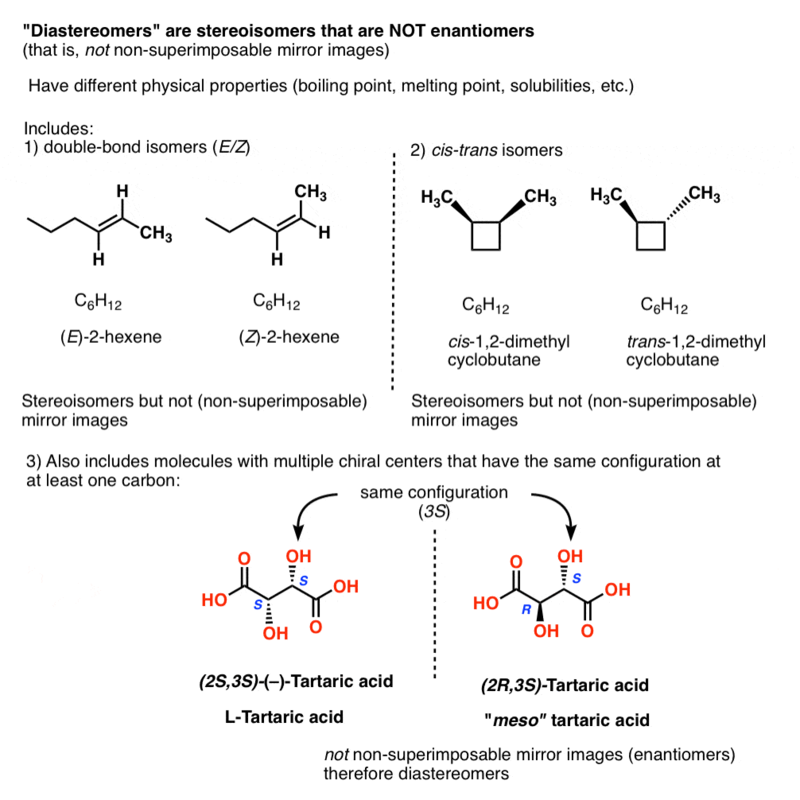 In organic chemistry, we call “stereoisomers that are not enantiomers”, diastereomers. 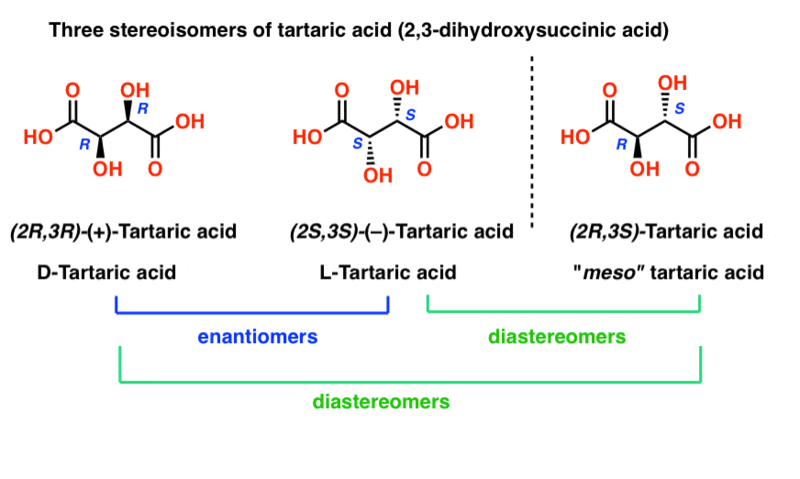 Just as Pasteur found meso-tartaric acid relatively easy to separate from “racemic”-tartaric acid, diastereomers have different physical properties (e.g. boiling point, melting point, solubilities, etc.). Take the two molecules below. Are they isomers? If so, what kind of isomer are they? The fastest way I know to answer this question is to try to name them both. So how are they related? Therefore… they are the same! (Actually, they are different conformations of the same molecule, and we make the assumption that all conformations of the same molecule are interconvertible, unless told otherwise. ) see footnote. This has been a long, but hopefully comprehensive and illuminating post on the types of isomers. In the next instalment we will learn a technique that – with practice – will allow you to quickly determine whether molecules are enantiomers, diastereomers, or the same. Thanks again to Matt for co-authoring. Ask Matt about scheduling an online tutoring session here. Generally we make the assumption that conformational isomers interconvert quickly on the timescale necessary to measure optical rotation. For example, the two chair forms of cis-1,2-dimethylcyclohexane are actually enantiomers, but since they interconvert so quickly at room temperature, they are treated as if they are the same. This is usually beyond the scope of introductory organic chemistry, but there are certain cases where this assumption isn’t valid. A prominent example is 1,1-bi-2-naphthol (aka BINOL). Conformer A (far left) can’t convert into conformer B (far right) without passing through a conformation where the two rings are coplanar (middle) , and the two hydrogens on each carbon (carbon 8) bump into each other. This presents a large enough barrier to rotation that each of these two conformations is “trapped” in its own state at room temperature and don’t interconvert. These two conformations are non-superimposable mirror images of each other in the same way that a left-handed and right-handed screw are non-superimposable mirror images of each other. They are said to have an “axis of chirality”. 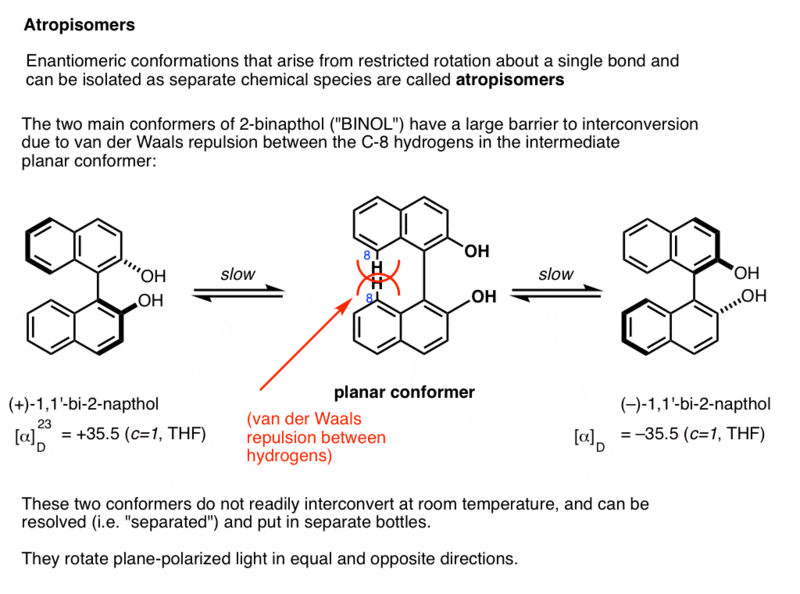 The barrier between the two conformers is large enough that conformer A and conformer B can be resolved (separated) and put in different bottles. This special case of isolable conformers is called “atropisomerism“. Hi! 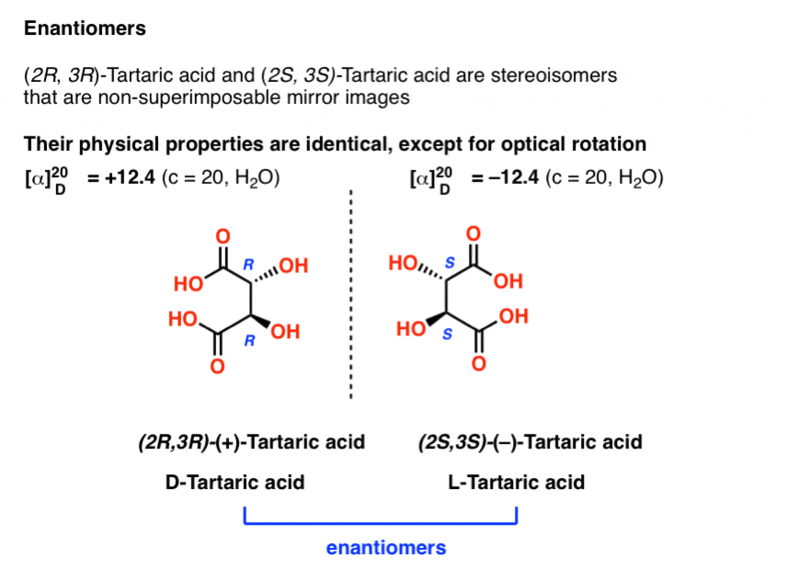 For the diagram titled ‘Non-superimposable mirror images: Enantiomers’ showing enantiomers of 3-methyl 1-pentene, should the R and S configurations be the other way round? I was just practising my R/S configuration but not sure if I analysed it wrongly. They are correct. I double-checked! Priorities are (1) alkene (2) ch2ch3 (3) CH3 and (4) H. For the one on the left, Since #4 is in the back, and 1-2-3 goes counterclockwise, the one on the left is S.